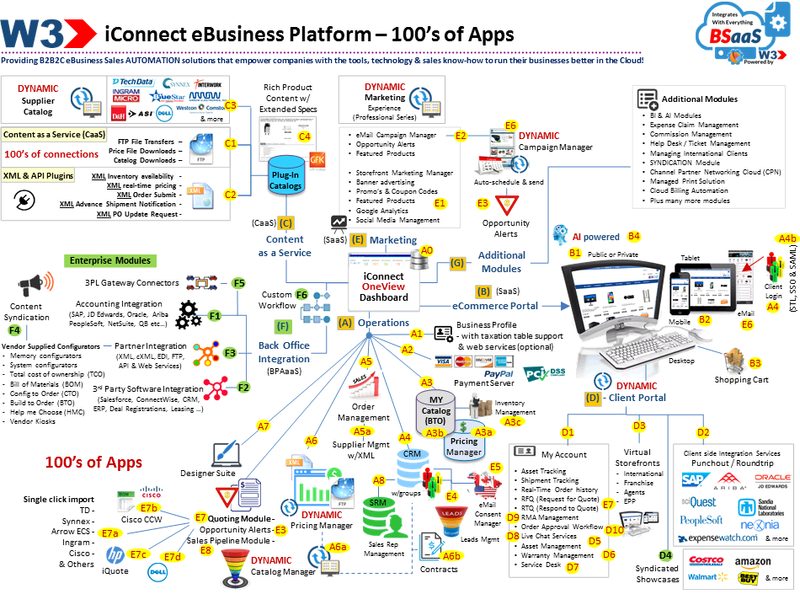 If you're looking for a PROVEN Solution to help you streamline, automate & manage all your business processes via the Cloud (OneView Dashboard); from Marketing & Lead Generation to Quote to Order to Procurement to Fulfillment to Invoicing through to Post Service Support along with FULL integration into your Legacy systems, Suppliers, Vendors and 3rd party software applications, then the iConnect eBusiness Suite - Enterprise Edition is what you're looking for! As an added BONUS, you’ll benefit from our Artificial Intelligence Engine that empowers your customers with a FULLY personalized online shopping experience. 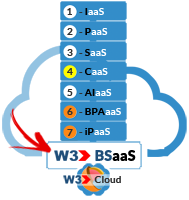 From SMB's to Large organizations, W3 has ALL the tools, technology and business know-how to help you streamline, automate and integrate ALL your end-to-end business processes in the cloud. 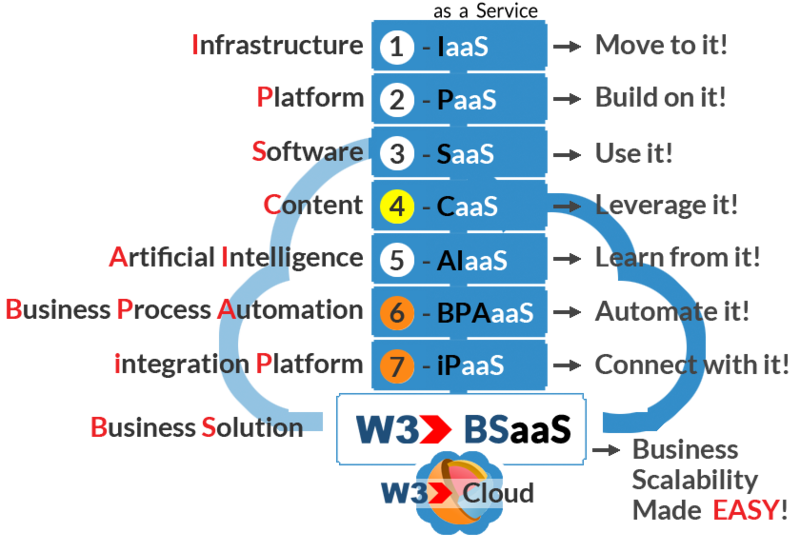 Whether you’re a coding expert or just getting started, W3 enables you with everything you need to quickly and easily configure, customize and launch your eBusiness solution the way you've always envisioned. When it comes to streamlining & integrating Legacy systems and 3rd party software applications, encountering hurdles is part of the journey. At W3, we like to 'Start Smart' by minimizing those hurdles using our proven 'Start Smart' eBusiness Review. 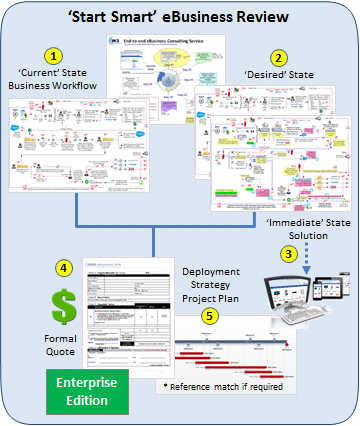 The objective of this exercise is to empower you with all the information you need (in advance), so you can make the right deployment decisions from start to finish and not solely based on a good sales pitch. 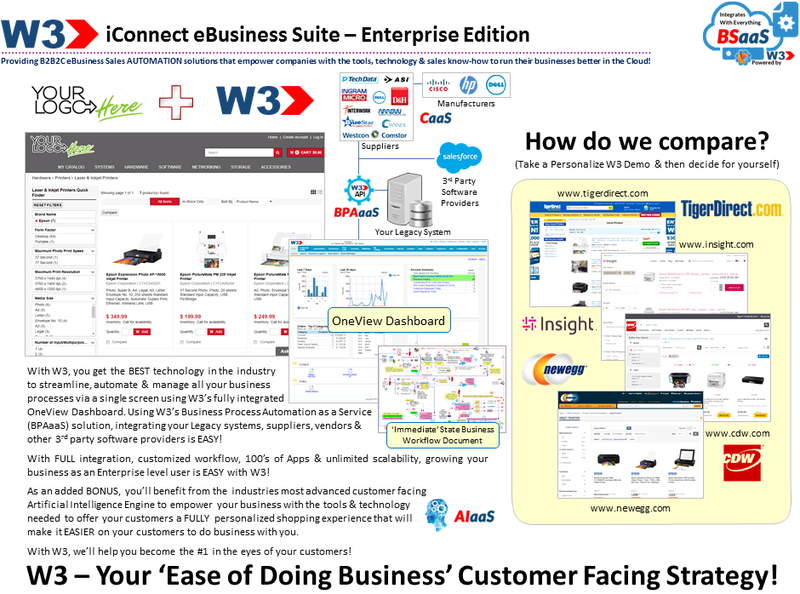 As a pre-requisite to licensing the iConnect Enterprise Edition, the 'Start Smart' eBusiness Review is a mandatory step in getting started. 'Start Smart' eBusiness Review, W3 will provide you with a formal proposal based on your 'Immediate' State eBusiness requirements. Upon your review & acceptance, W3 will provide you with a Project Plan and a Deployment Strategy to get your project started.